The psychic income from happy clients who are achieving their goals. The independence and freedom, the people, and working with our many appreciative clients. Being the first professional employee at our predecessor firm Kochis Fitz. Earning my CFP® and CFA certifications. Teaching at U.C. Extension and other Financial Planning Association involvement. My many and varied contributions to Aspiriant over a long period of time, and my current position in the firm. Wealth represents the resources that permit people to make claims on society’s resources, which are sometimes scarce. Spending time with my family, reading, trail running (when healthy), golfing, and cooking. I also love chess and playing pool but rarely find enough time to pursue those interests. Arthur Schlesinger, Jr.’s biography of Robert Francis Kennedy. His personal evolution, growth, empathy and compassion were remarkable. I’d be working somewhere else in the finance and investments industry. Becoming a shareholder of the old Kochis Fitz. Being named to Barron’s and Worth’s lists of top advisors. Being part of the great team of people that helped build this firm. Running a marathon in 3:03 and a hilly 50k trail race. My great personal relationship with my children. Tom is the Chief Client Officer at Aspiriant in charge of our client service offering and maintaining the highest level of innovation and expertise possible. Tom was the first post-founding professional employee of Kochis Fitz, the predecessor firm to Aspiriant. He joined the firm in 1992 and became a principal in 1995. He has provided comprehensive personal financial and investment planning services to hundreds of professionals, senior corporate executives, business owners, and other high net worth individuals. Tom has been recognized as one of the country’s best financial advisors by Worth Magazine and in 2009 was ranked as one of the top 100 Independent Advisors in the nation by Barron’s. 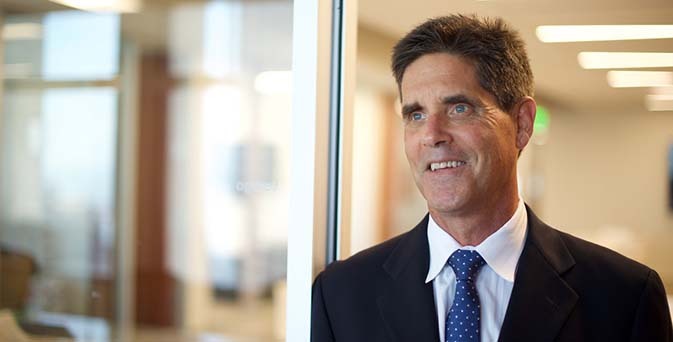 Tom began his financial planning career in 1989 as a member of the Executive Financial Counseling group at Deloitte & Touche, where he actively assisted in the development and delivery of comprehensive financial plans for clients. At Deloitte, he also worked in the tax department, acquiring broad experience and expertise with individual income tax issues and planning. He is an active member of the Financial Planning Association, currently serving on the San Francisco chapter’s program committee. In past years, he taught Investments and other classes in the Personal Financial Planning Program at University of California, Berkeley. Tom has spoken to numerous professional organizations about investment and tax topics and has co-authored material published by CCH, including the book, Wealth Management, A Concise Guide to Financial Planning and Investment Management for Wealthy Client. He has also served as a guest columnist for ABCNews.com. Tom earned a BS degree in Economics from California State University, Chico and an MBA (Distinguished Student Award) in Finance from San Francisco State University. He successfully completed the Certified Public Accountant (CPA) examination in 1993 and received his Chartered Financial Analyst credential in 1995.